The College of Urban Science held an exhibition from June 4 to June 10 on the 21st Century Building, Kyongnong Hall, Birch Hall, and the Gallery of Seoul Citizens Hall. Students who major in the Department of Architectural Engineering, Architecture, Urban Planning and Design, Transportation Engineering, Landscape Architecture and Geoinformatics participated in this exhibition. In the International Conference Room of the 21st Century Building, the Department of Architectural Engineering and Architecture exhibited their architectural projects. In Kyongnong Hall, the Department of Urban Planning and Design and Department of Landscape Architecture showed their results of spatial designing projects. In Birch Hall, the Department of Geoinformatics and Department of Transportation Engineering displayed their projects such as mobile applications for traffic conditions based on geoinformatics. Incepted to 32 years, the Exhibition of the College of Urban Science has an objective that allow different disciplinary academic fields of urban science to exchange ideas. 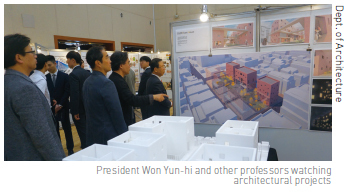 For this objective, part of the exhibition was held in the Gallery of Seoul Citizens Hall so that many professionals and participants could communicate on urban policies, especially those of the city of Seoul. One of the students who participated in this exhibition, Kim Sung-hyun (Dept. of Transportation Engineering, ’14) mentioned that it was rewarding for her because she was given practical feedback by officials and could suggest to them policies that needed to be improved. Also, “While preparing this exhibition, one thing I was surprised at was that most departments in the College of Urban Science were recognizing and focusing on similar urban issues. Although students in each department of our college are taught different specified technologies for dealing with urban issues, most of them selected similar projects such as coping with urban disasters and solving matters derived from excessive urban agglomerations. Furthermore, we tried to make solutions so that most people can live in urban areas that are sound and safe places,” Kim said.